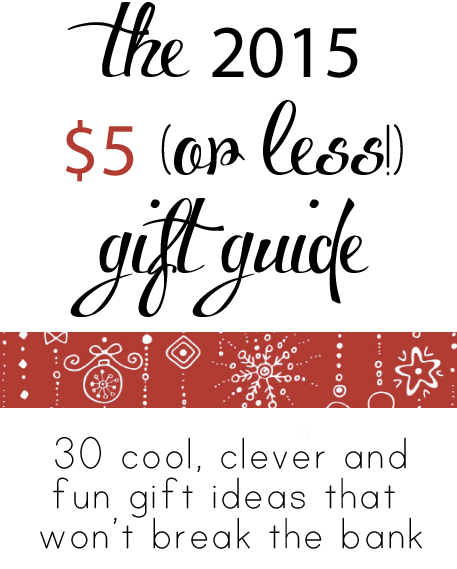 Of all the posts I do during the year, the $5 gift guide is definitely in the top ten. I love finding cool stuff that looks more expensive than it is and is just plain awesome. Whether you’re looking for stocking stuffers, a little gift for a teacher or neighbor, or something to add to a bigger gift for that little something extra, there’s something here for every taste and age. And for that person who you absolutely have no idea what to buy for? Might I suggest the Emoji Stickers? This year I did 30 instead of the 20 I’ve done for the past 4 years. Sometimes I just want to be an overachiever. AND for the first time, the images are clickable (there are 3 on the very last image that you can’t click through to, but everything else does). So, that might hopefully make your life a little easier. 1. Frog Contact Lens Case ($3.90) – As a daily contact wearer, I’d love using this cute case instead of the totally dull one that comes with the contact solution. This googly eyes one is also fun. 2. Heart Whisk ($1.99) – Months and months ago, my friend Stephanie suggested this for the gift guide, telling me it was one of her favorite kitchen tools. I seriously love it. Tie it onto a stack of dish cloths or add a bottle of vinegar or olive oil for an extra fun gift. 3. Glass Beaker Pitcher ($4.95) – This is just really awesomely cool. Perfect for your science-loving friend. 4. Mini Mint Colander ($1.99) – This is perfect for washing berries or a handful of spinach for a sandwich or just displaying a few things on the counter. It comes in half a dozen different colors too. It’s so cheap, you could add a couple of winter citrus and still come in well under $5. 5. Yellow Dip Mug ($2.97) – I used to have some pretty nice glass mugs (like these ones which are also under $5) and they appear to have gotten lost in the move, so now I’m in the market for some new ones. These are a cool shape and a nice modern design. 6. Ninja Bandages ($4.95) – I’m really into ninja everything this year and these little bandages are killing me with the cuteness. 7. Munchkin Bath Crayons ($4.19 for a 5 pack) – After all our bath tub toys were getting disgusting, Bart chucked them all and I bought these bath crayons to replace the forty million rubber ducks we had. They write on the bathtub and tile then wipe right off and they are SO COOL. 8. Sally Hansen Golden-I Nail Polish ($2.52) – This is my current favorite nail polish; it’s perfectly festive without being over the top. And the Hard as Nails line from Sally Hansen is just ridiculously good – I can get nearly a week of wear out of it, which is better than a lot of the higher-priced polishes. 9. Duncan Yo-Yo ($4.85) – When in doubt, get a yo-yo. My in-laws gave us one a few years ago and my girls love playing with it (even if they actually have no idea how to use it. I should probably show them). 10. Flameless Tealight Candles ($4.99) – I bought some of these for our Halloween luminaries a couple of years ago and they are (and this candle holder is also under $5 and perfectly festive but also appropriate year round). 11. Stoneware Berry Basket ($4.95) – I have been wanting one of these forever and maybe it’s time to just bite the bullet. Add some fresh berries if you can find them or fill it with pistachios and, wrap it up with a bow and voila! 12. Sriracha to Go Keychain ($3.50 each, in packs of 10) – I know, you have to order this in a set of ten. But I couldn’t leave these off because I love Sriracha and apparently it’s super hip and trendy right now. And the idea of having a little keychain of a condiment just amuses me to no end. 13. Twisted Celebration Candles ($5.95 for 24) – These are just over the limit, but I’m going to say you could just divide them into two sets of 12 and then they are WELL under $5. I love fun candles – they just make any birthday a little more special than a pack from the grocery store. 14. Grass Pen ($4.95) – I don’t know what it is about this pen that I find so intriguing but . . . I can’t get over how awesome it is. 15. Fingernail Friends ($5.09) – My girls are obsessed with painting their nails (I can’t tell you how many times I’ve come into my bathroom to find Ani sneakily painting her own fingers and toes), so I’m definitely getting these for their stockings. 16. Modern Paper Clips ($3 for 50) – Not so flashy that you can’t use them professionally, but the fun colors and slightly modernized design makes them way more awesome than your standard silver paperclip. 17. Mini Clothespins ($3.99 for a 12 pack) – My grandfather likes to say, “Anything mini is cute” and it’s definitely true for these little clothespins. I can think of about fifty uses for these right off the top of my head. 18. Sephora Super Nourishing Lip Balm ($5) – I got this at the favorite things party I went to about 8 months ago, and this has been my favorite thing I got. I use it every single day, either on its own or under a lipstick or lipliner. 19. 5-Minute Hour Glass ($4.95) – This is such a cool and unusual gift. Wouldn’t it just look gorgeous on a desk? 20. Yellow Polka Dotted Bowl ($2.99) – I love small serving bowls for soup or salad toppings (or a large bowl of ice cream). There are six colors and all of them are under $5, although this yellow one is the cheapest at $2.99. 21. Emoji Stickers ($3.82 for 912 stickers) – These are my #1 favorite thing on this list. I mean, how could you not? 22. Mini Graters ($1.98 for a set of 2) – Package these with a few heads of fresh garlic or whole nutmegs and, voila! Useful and thoughtful gift. 23. Powder Play Hair Texturizing Powder ($3) – I bought this last year when Merrick recommended it to me, and it is the best. My hair REALLY wants to be flat, and this seriously helps combat that. Also, it’s usually $7 and right now it’s $3, so if you’re a fan, stock up. 24. Bookmarks ($3) – These are definitely a step up from the grocery store receipts I usually use to keep my place. 25. Clothespin Chopsticks ($3.95) – Bart lived in Korea for two years and is very handy with a pair of chopsticks. I am decidedly not. These clothespin chopsticks are probably just what I need. 26. Eyebrow Pencil ($1.99) – I’ve had one of these for months and never used it and then on a whim one morning, I tried it out and then I thought, “What was wrong with me?” It has seriously improved my eyebrow game. 27. How to Do Your Own Laundry Print ($5) – Poor laundry rooms; they always get left out of the decorating. This fun colorful print is just right for sticking up in your laundry room. (I love everything from Caravan Shoppe and they even have free prints like this one). 28. Vintage Milk Bottle ($2) – My mom bought me a dozen of these for my birthday two years ago, and I use them ALL the time. They make cute glasses at a party with a paper straw, they’re fun to fill with candy and they’re great for homemade ranch or strawberry balsamic dressing. And if you have a small bunch of flowers, they are the perfect vase. 29. We All Have Baggage Tag ($5) – I love a good luggage tag and this one makes me laugh. This one is also amusing. 30. Printed Car Charger ($4.90) – Is it just me, or are phone batteries totally weak and always dying at the worst possible minute? This is not only useful, but also so cute. Seriously, I love every item on this list. And, if you need more ideas, here are the (very excellent is I say so myself) lists from 2014, 2013, 2012, and 2011. Love all these ideas! Great list. Heads up-your numbers are off! Oof these are in the wrong order and it's really throwing me for a loop. Thanks, ladies! That's why I try not to work at night because my brain is obviously shot after 10 p.m. All fixed now. I think your numbers might be off, however, I love the gifts! We are doing our Secret Santa a little differently at work this year so these are good idea for me! I like how you have to "Bite the bullet" on a $4.95 purchase. That right there tells you basically everything you need to know about my relationship with money. I so needed this list. Thanks, Janssen! Yessss. I have a Favorite Things party coming up and was just thinking about these posts. Thanks! I have the perfect person to gift emoji stickers to! Thanks! And also, have you seen the Sriracha documentary on Netflix? It's amazing. I love those emoji stickers! I think they might be the number one thing on my wish list now! Also, eyebrow pencils are HUGE game changers.